Candle lighting has always been the most preferred extra lighting when it comes to organizing a family get-together or a dinner with a loved one. 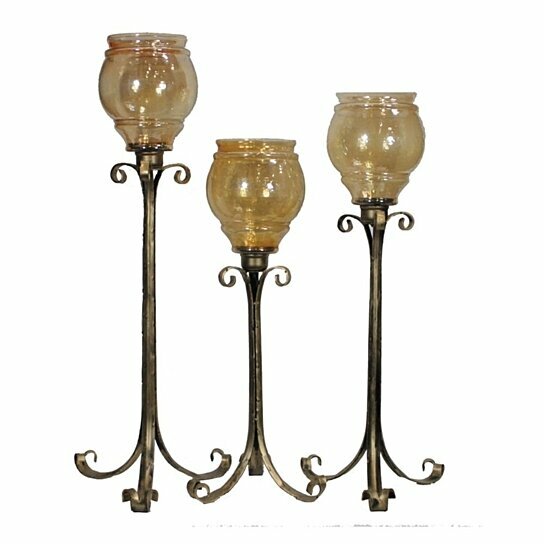 This set of three candleholders in different size would be a great addition in your home. Similar in looks but different in size, these define sheer beauty. These candleholders have a tripod stand. There is a hammered glass sconce rested on curved accents. The stand is washed in bronze with a metallic finish, while the glass holders have a shiny golden tinge. It can be gifted to near and dear ones on special occasions. During festivals, weddings and other parties, you can use these as decorative pieces.